I'm lucky, I have no allergy to any food or any sort of intolerance. I can EAT everything. So when It come to baking , I have it pretty easy. I can use and eat it all. For those who know me through Instagram, you know I bake quite a lot. This is how I operate: I look in the fridge and the cupboard and figure out what I can put together to make something tasty. I know a lot of people like to follow the season, don't get me wrong, me too but I like to use what I have easy to reach first... I like the challenge. I had to work alone on a Sunday afternoon but it was very quiet. So I decided to bake for the team. I knew we had blueberries so I thought I 'd bake some muffins for everyone. BUT WE HAD NO EGGS LEFT! NO EGGS! NO NO EGGS! I was going to go to the shop but I had no one to cover me. Luckily I remembered one of my friends, who's is vegan, told me that she uses Tofu to replace eggs. I did not have a clue how to work it out... so I Googled it! 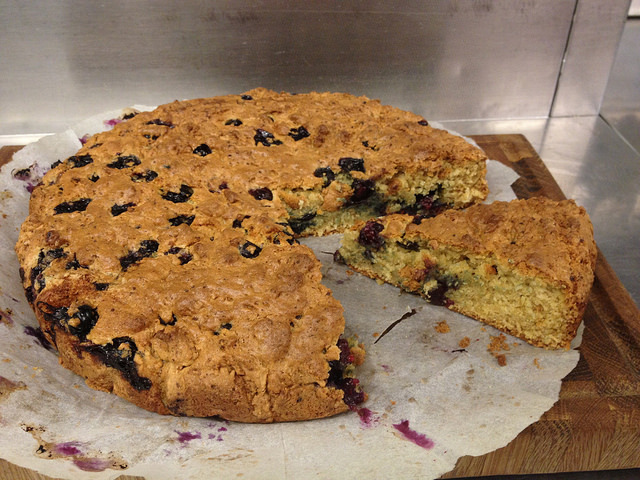 I clicked on the first link and It was Madhuram's Eggless Blueberry Poundcake. So I decided to test it. First of all preheat your oven at 180C for 15 minutes. Grease and cover the inside of a cake tin with baking paper. 1. Mix the tofu and the yoghurt together then add the milk and the vanilla extract. Don't worry if its not completely smooth. I couldn't get rid of the lumps. I will disappear once the cake it cooked. 2. In another bowl mix your dry ingredients together. The flour, baking powder, baking soda and salt and set aside. 3. In a 3rd bowl (yeah I know quite a bit of dishes to do afterwards ahah) cream the butter and sugar until it’s light and fluffy. It will take about 5 minutes. 4. Add step 1. to the butter/sugar mix in 3 additions, beating well after each addition. 7. Pour the batter into the tin and bake for about 60 minutes or until a toothpick inserted in the center of the cake comes out clean. Double check after 30min. And finally once the cake is done, remove the pan from the oven and let it cool on a wire rack. Don't rush yourself to remove it from the tin. let it cool down for a bout 30 min and then you can start digging into it. I couldn't believe how moist it was. so tasty too. It was finished in no time so I guess everyone liked it. I DID!